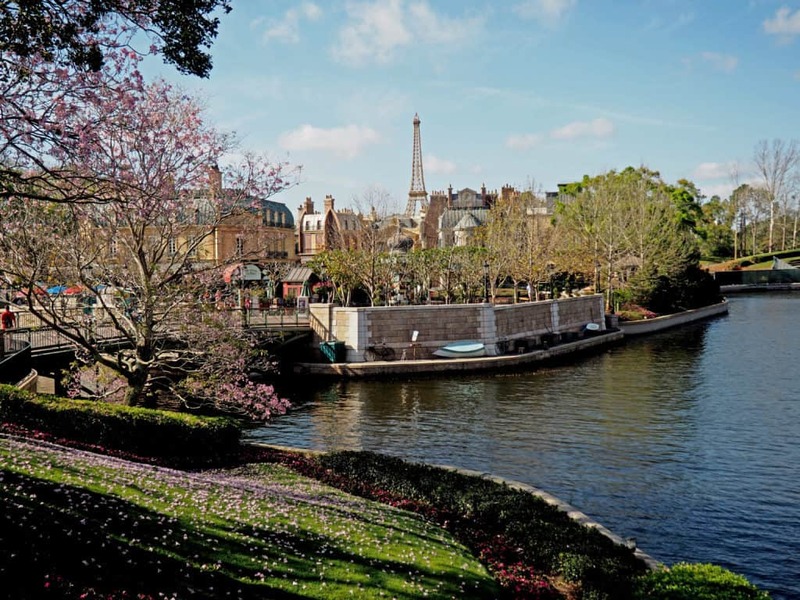 We could argue that Fall is the best time to visit Walt Disney World. With the Epcot Food and Wine Festival, Mickey’s Not So Scary Halloween Party, Free Disney Dining offers, and the excitement of cooler weather we’re happy to venture to Orlando during what is sometimes the rainy season between August and November each year. 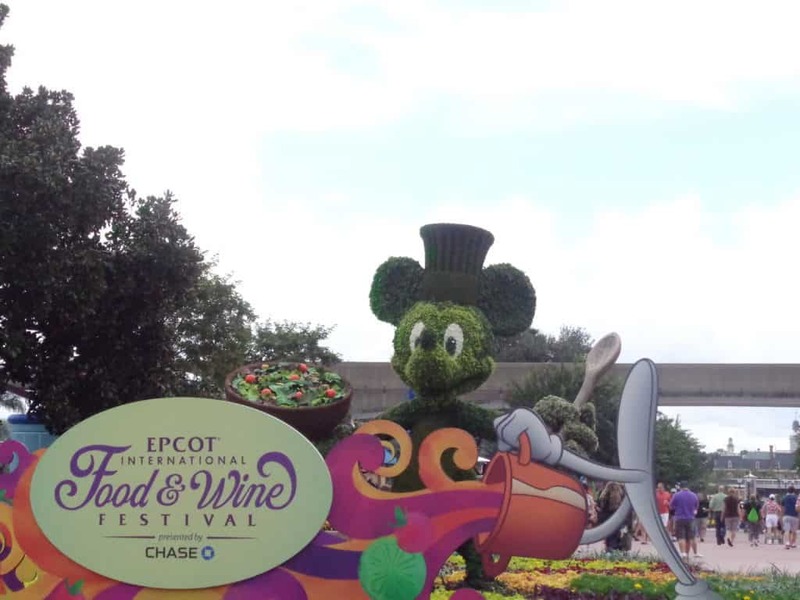 But tackling the Food and Wine Festival at Epcot is something of an art if you want to make the most of your visit! If you’re traveling to Epcot with kids beware the adults that are stumbling around the world and possibly right into your stroller or elderly grandmother! 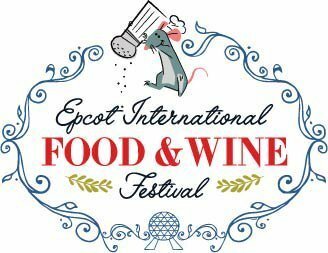 These are our best tips for enjoying Walt Disney World’s International Food and Wine Festival at Epcot. Monday-Thursday is the best time to visit the Food an Wine Festival for obvious reasons. With the festival running about 75 days we’ll see the crowds spread out a bit, which is no doubt Disney’s goal. Both Annual Passholders and Florida Residents are regular weekenders to the festival because of the eclectic food choices and wide array of alcohol on hand. This leaves those weekdays for when families are vacationing at Disney a little less crowded. Mind you, the evenings at Epcot will always be crowded during this time period simply because there are bands and extended hours that still draw out the locals. To get the most out of your trip you’ll want to do a little pre-planning. While you can definitely show up, get your foodie passport and take to the countries without a plan, we like to be a little more intentional with our food choices! Not to mention daydream about all the options. A plan will also help out your wallet a bit. It is VERY EASY to drop hundreds of dollars on very small dishes of food that may not really fill you up. It’s even easier to drop hundreds if you’re drinking. So check out the menus first and figure out a plan of attack. Decide ahead of time what your Must-Have food and drinks are going to be and then plan the budget so that the bulk of your food kiosk visits come around meal times. 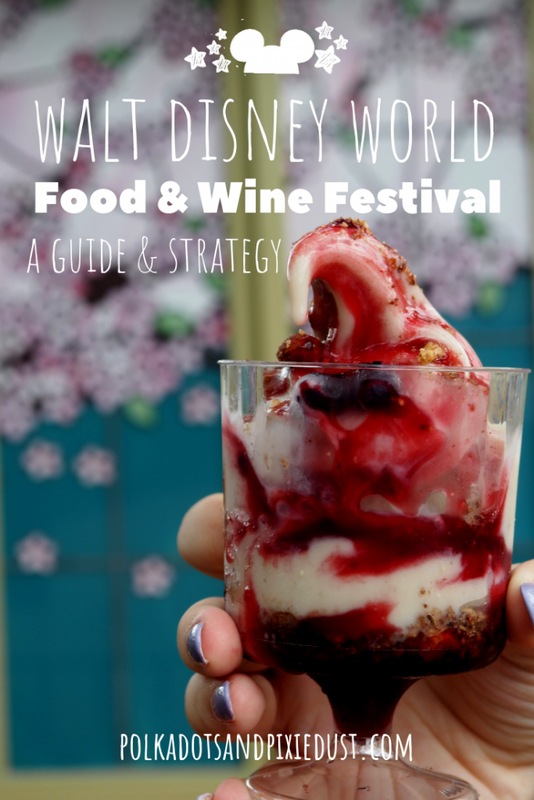 Check out the Food and Wine Festival page on the Disney Website for menus by country. Depending on the menus or picky eaters in your travel party, there may be some countries you don’t want to visit. Planning this ahead of time allowed us the time to visit the countries and kiosks in order of location without losing a lot of time and wasting foot traffic. 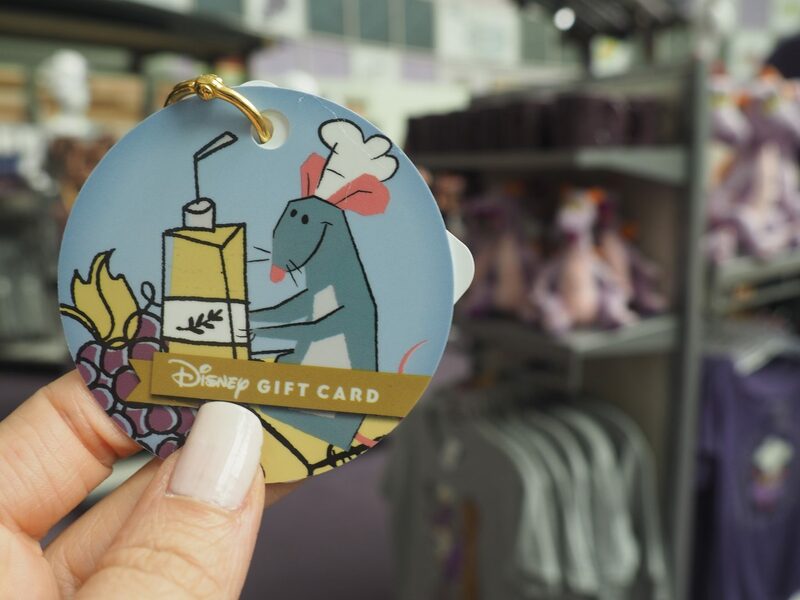 If you’re on the Disney Dining Plan and have stockpiled your snack credits, you’re in luck. Many of the mini food portions are able to purchased with snack credits. 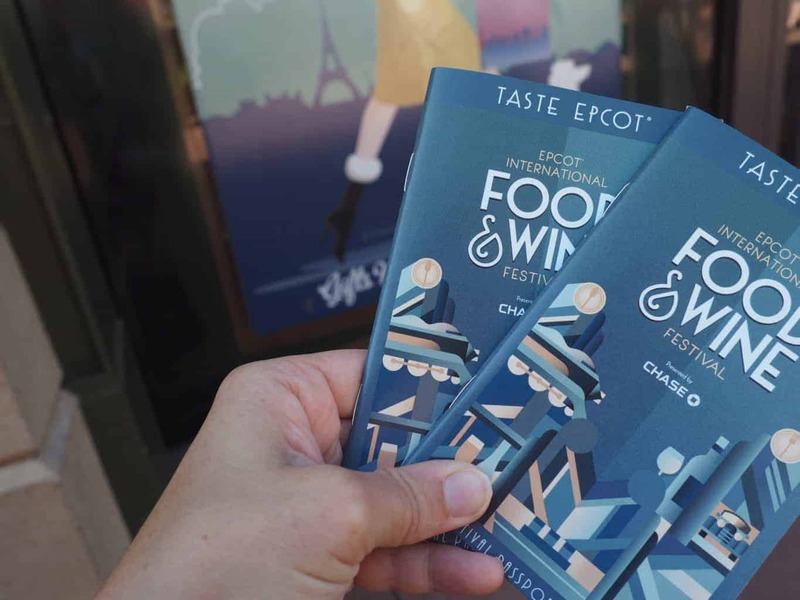 For this reason, if you are using snack credits you should plan that your Epcot day will be closer to the end of your trip so you will have enough stockpiled to taste test all your heart desires. The foods that are able to be purchased with credits are labeled with a DDP at each kiosk. They are also marked with the foodie passport you get when you arrive. A neat trick we use to get the most bang for our buck is seek out the snack with the DDP symbol that costs the most. These are usually slightly larger portions and stretches your credits a little farther. That way if you want a few things from a kiosk you end up spending the actual cash on cheaper things. Our absolute best advice is to pay for Food and Wine treats with a festival gift card. You can load the gift card with whatever amount you would like and it allows you to stick to budget without having to keep track as you go along. We’ve tried all of these ways for budgeting the festival into our trips and the gift card method is our favorite. Giving each person in your family or party a 50 dollar giftcard could easily satisfy about 10 goodies that could double as your meals for a day. If you’re not on the Dining Plan and you’re ready and able to pay cash then plan around 5 bucks for each sample. Know that these are tasting size portions. And while many do cost a little less than 5 dollars, the ones that cost more will help you stay on track with your spending. Keep in mind there are about 30 kiosks through the World Showcase, even if you only try things from half of them and pay 5 bucks each at 15 kiosks you’ll be at 75 dollars per person. So budget accordingly. Another option if you’re not on the dining plan, and one we often see lines out the door for, is to grab the Food and Wine Entitlement plan. This is a plan you can purchase in Future World right at the Festival Center near the Electric Umbrella. You can choose an 8 Food and Beverage entitlement or a 16 Food and Beverage Entitlement usually around 70 and 120 dollars a guest respectively. These amounts are above the regular Epcot ticket price and worth it if you’re at Disney to drink. The entitlement tabs usually pay off if you’re spending about 8 dollars per entitlement. Since so much of the food is less than 8 dollars, it doesn’t really make this option worth it unless you’re consistently buying the drinks that are over 10 dollars. So keep that in mind if you use this option. 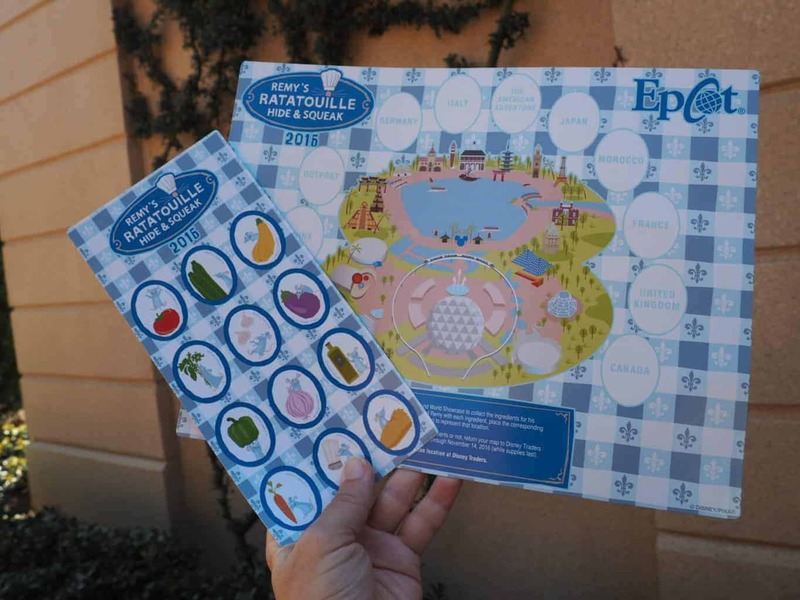 Just like the Epcot International Flower and Garden Festival you get a passport at the Festival Center that includes menus for each kiosk, drink lists, and stickers you can use to mark off each country that you’ve visited. We love the passport as part of this experience. Its a perfect free souvenir and makes the journey through the country super fun. If you’re looking for Kid-Friendly foods at Epcot just look for the Pear in the passport next to the food lists. You’ll also find gluten free and vegetarian markers throughout the passport as well to help you make good food choices. This is one of our favorite passive Free Kid Games at Disney. Much like Sorcerers of the Magic Kingdom, Hidden Mickeys or Hidden Pascals you can do this on your own whenever you need a little non-ride or down time. Stop at the gift shop to pick up your Hide and Squeak map. Each map is about the same cost as whatever souvenir they offer that year.(~8.95). Once you’re finished playing the game you get to choose one of the limited edition Remy items. They offer pins, keychains, cups, depending on the year, all specific to this game. (So you’re basically paying for the souvenir and getting the game for free). More fun is that these little Remy’s in each country are actually pretty hard to find in some countries! So embrace the challenge. 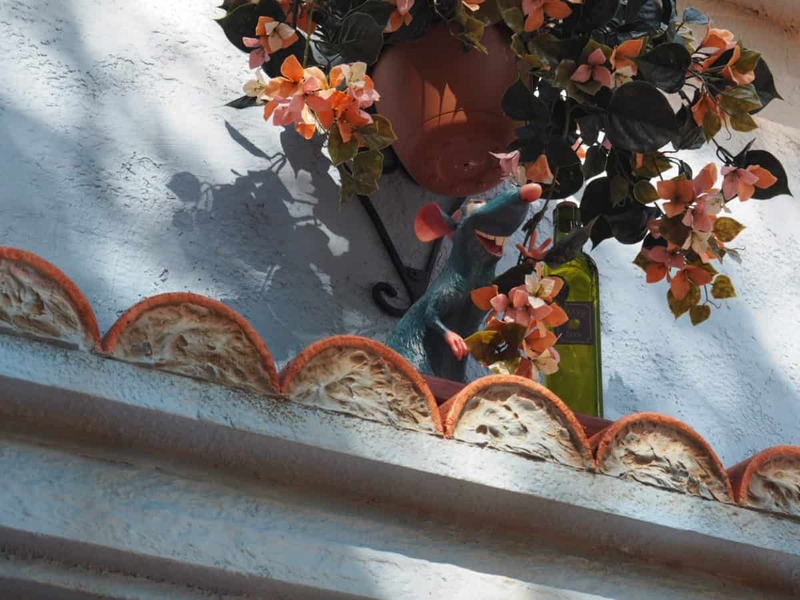 Little Remy statues are hidden in every country. 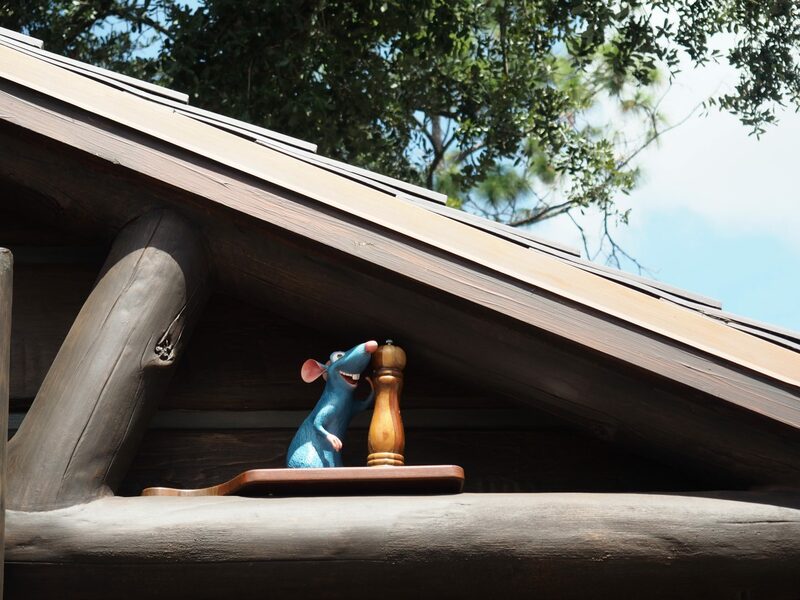 Sometimes he’s on a building or in a garden and the game is great way to occupy the kids as you enter each country but it does get a little harder to play as you hit dinner time because of the crowds so hide and squeak early if you hope to find every Remy. Finding fun non-alcoholic drinks is not as hard as it sounds! They are labeled non-alcoholic in the passport and there are quite a few! 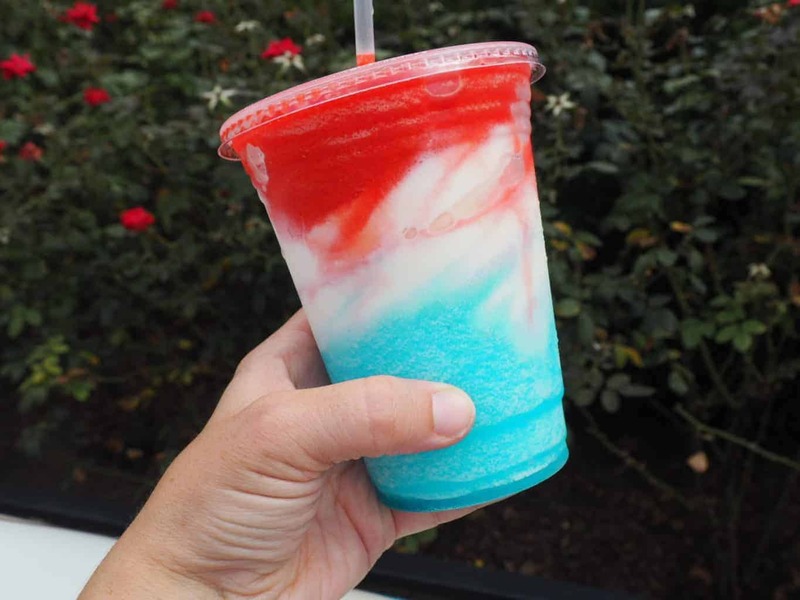 Check out some of our favorite non-alcoholic drinks across the parks for a head start. There will be special ones in the passport though, so be sure to do your homework and choose which ones to try ahead of time. While many of the kiosks won’t open until 11am you can get closer to the action by booking an early breakfast in the World Showcase. If you’re looking for a character breakfast try Akershus Royal Banquet Hall and book a 9am Frozen Ever After Fast Pass to skip the lines later. You could also visit France for breakfast. The bakery is open and a perfect way to be near Belgium for the Belgian Waffles when the rope drops. Epcot is a big place and there’s a lot of walking. Don’t waste time going back to the resort or another park to escape the crowds. Take breaks instead with rides or shows. There are several shows including O’Canada and Impressions de France that are inside and can provide an escape from the heat or rain. MEXICO: We adore the Gran Fiesta Tour boat ride and its a great escape from the heat, rain or chaos. There’s not usually much of a line and the longest we’ve ever waited for this was about 15 mins. The ride was updated this year with Three Caballeros animatronics and looks great. The faux open-air market in the Mexico pavilion is a fun way to shop for souvenirs or join the masses and have your pic taken while wearing a gigantic sombrero. NORWAY: The Frozen Ever After ride is a must see if you’re up for waiting in the line (which we hear is kinda cool ) or have a fast pass. While we think Frozen Ever After is awesome and should be on the bucket list of every young(or young at heart) Frozen fan, if the lines are too long, keep in mind that the Royal Sommerhaus is now open for meet and greets with Anna and Queen Elsa. This is a fun line with what seems to be a usually pretty short wait! We waited around 15 mins and every time we passed by, this was no more than a 20 minute queue. You can also stop at the Kringla Bakeri Og Kafe for a cannoli-like dessert called the Trolls Horn. So delicious! CHINA: Check out the Dragon Legend acrobats inside the China Pavilion and the new Shanghai Disneyland Exhibit, featuring cast costumes, concept art and a map of all the cool new lands at Shangahi Disneyland. GERMANY: The miniature train and village near the Germany Pavilion gets updated each season and is a delight for the little ones. We can never turn down the call of the Werthers Original store, apparently the only store here in the U.S., whether its the caramel popcorn, apples or some other caramel treat by the time we get to Germany it’s usually time for a snack. The toy store in Germany also has clocks, bears and the Kidcot stop if you ( or the kiddies) need a break. Snow White is also stationed here next to her wishing well at select times. ITALY: The street performer and gelato warrants a short stop at the Italian Pavilion though there is not too much to do here! We’ve been trying to dig deep into the Italian Pavilion to see what magic it holds but other than Via Napoli, have come up empty so far so if you have any suggestions here let us know! AMERICA: As Americans we’ll admit we’ve never seen the American Adventure, in truth we only stop at the America pavilion for one thing: The American Dream. The American Dream is a layer of strawberry slushy, a layer of vanilla soft serve ice cream and a layer of raspberry slushy. So delicious and only found at the Fife and Drum Tavern kiosk. The America pavilion also has a public style indoor eating space, so know that even if you aren’t eating here, its a great place to head for a break from the heat. We like getting a treat from another country and stopping here to enjoy it in the air conditioning. JAPAN: We love the shopping here! The Cute Kawaii Japanese Culture is a joy for kids and grown ups alike! If you’re a millennial with little ones you’ll enjoy the dragon ball z, zelda, studio ghibli and hello kitty merch. You’ll also love the Matsuriza Drummers at the Japan Pavilion. This show runs a couple times a day and definitely worth a watch. MOROCCO: A more adult atmosphere here, the things we love about Morocco for families are the photo ready fountains for picture taking and Aladdin and Jasmine character meet and greet (the cutest couple ever). You can also make a Kidcot stop here. Keep an eye out for the shirts with a camel in Morocco, the word Habibi on the shirt means “my beloved”. FRANCE: We love France!!! The cute gift shop attached to the bakery near the Impressions de France film is quaint and filled with Belle, Aurora and Paris merchandise. A great place to stop, grab a table for the kids and put your feet up. You can also stop at L’Artisan des Glaces. 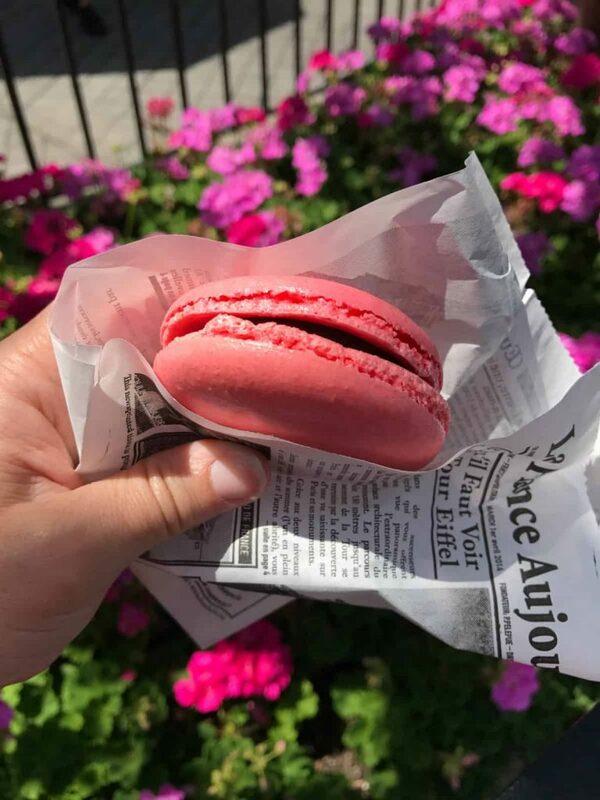 They serve a macaroon ice cream sandwich and is a great place to stop for an afternoon treat. We also got the Creme Brulee Caramel Chocolat at the France Kiosk to give G her first taste of Creme Brulee. You can see both Belle and Aurora and the Serveur Amusant Acrobats here throughout the day. THE BOARDWALK: via the International Gateway, is a great way to take a break from Food and Wine if you need it. Little beaches, shops, Ample Hills Creamery(yummm), cupcakes and a ferry can all provide respite if your kids are ready to call it a day. This is also a great place to escape to at night if you ended up going to the Food and Wine Festival during the weekend and need to get away from the crowds. They have magic shows, arcade games and lots of other fun little activities like a real boardwalk would have to keep the kids entertained. UNITED KINGDOM: Mary Poppins and Alice are big reasons to stop in the UK but we also can’t get enough of the tea shop. Sometimes they have tastings here and they always have a special drink for food and wine. 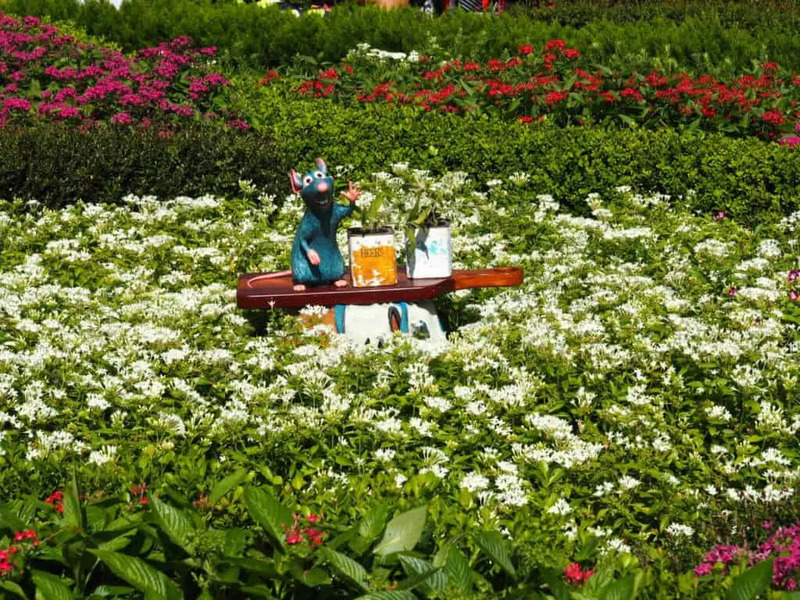 We discovered the gardens behind the main shop during our Agent P’s Adventure and believe that to be the best place in Epcot for a true rest. Secluded in the corner of the UK are benches, the gazebo and a garden that hardly anyone visits. Perfect for some down time. The Pumpkin Chai Tea and Carmel Milkshake is located at the Ireland pavilion in this area and since they include a recipe card it’s something you can try and make at home. CANADA: Apart from the O’Canada 360 movie there isn’t a ton to do at the Canada pavilion but walk around. We love the rope bridge and waterfall here though and since a lot of people don’t venture back that far, its usually not that crowded and can be a great escape if needed. The Kidcot area is hidden behind the gardens in a pavilion and offers the kids some coloring time if needed. Leaving the Park can be a nightmare at the end of the day if you’re using Walt Disney World’s bus system. The time the park closes is important to consider if you have kids in tow. Long lines waiting for the bus can mean cranky kids, especially after a long day. And with long lines, your chance of scoring a seat on the bus decreases. By a lot. Generally, we notice the buses seem to be the most packed from about 30-45 mins before closing to about 30-45 mins after closing. We always aim for the latter as we enjoy having a half or mostly empty park, however this might not work for families with small children who are out past bedtime. Keep in mind, this is really just an estimate going by what we’ve seen over the years, so plan accordingly. This is a great time to use Uber as well if waiting for a bus seems a little unreasonable after a long day at the park. The top tip to keep in mind is too either leave around dinner time or expect to stay right up until the park closes. If you choose not stay for Illuminations, catch the water fountain show on the way out towards the front of the park. It’s a great way to wind down and hang out while the bus lines fill up. 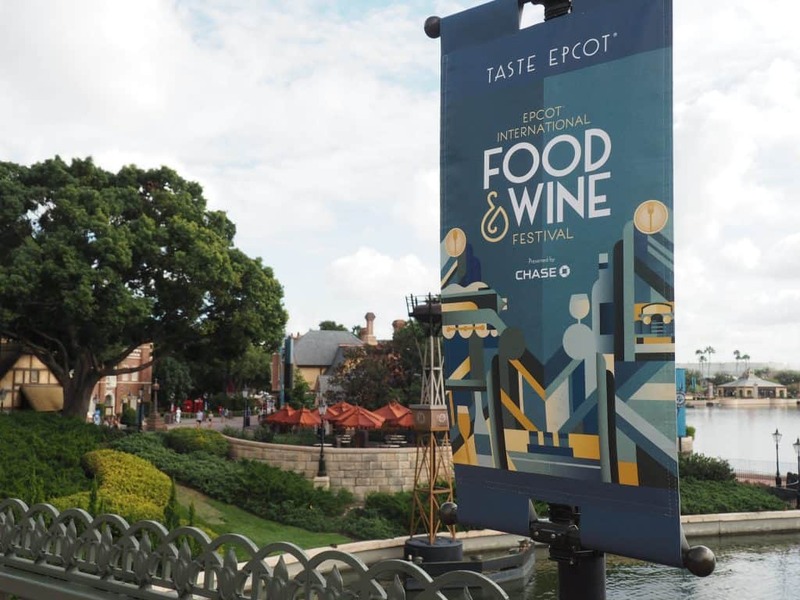 Whatever your plans for fall we hope they include the Food and Wine Festival at Epcot. If you visit be sure to let us know what you loved!